Description: Will this dangerous quest lead the outcast Orphan King toward an ancient secret—or to certain destruction? Posing as a beggar, Thomas escapes Magnus after fifteen men, who are calling themselves the Priests of the Holy Grail, arrive and take control of the castle through wondrous acts and apparent miracles. With the help of his longtime friend Gervaise, Thomas sets out on a journey that leads him to the ancient Holy Land. Unaware that Katherine and Hawkwood are watching over him, Thomas is tested in his beliefs and comes face to face with the ancient power that the Merlins and Druids have long been searching for. I have been snapping up this series to review as each book has come out. 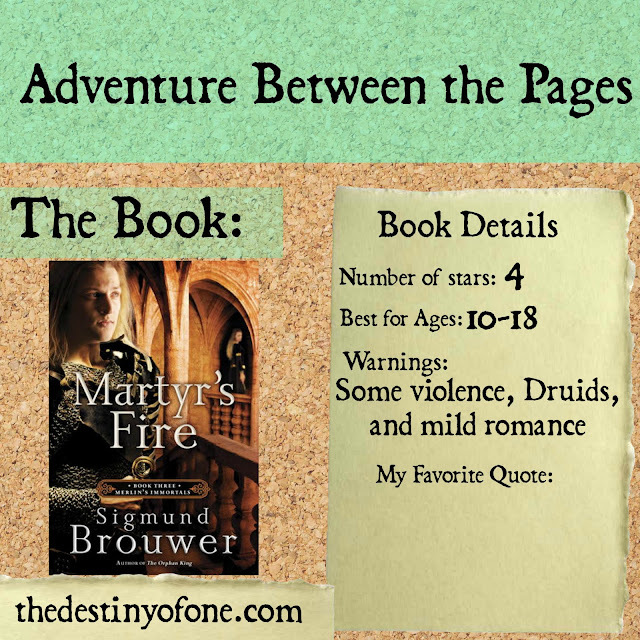 Set in my favorite time period (the Middle Ages), and full of nonstop adventure, how could I help but love it? On a lazy Sunday afternoon I picked up this book to read and finished it in a day. Again I was plunged into the battle of good versus evil in Magnus. The young ruler, Thomas has new enemies, the Priests of the Holy Grail, who are not all they appear to be. Thomas is forced to flee Magnus and look for answers to questions that have been plaguing him since book one. About half-way through this book, I wanted to scream. To be honest, it was getting really old that nobody was trusting anybody and secrets are kept secrets from the reader. That was great in the first book, okay in the second, but by the third book, I wanted answers and some trust. Thankfully, much is revealed by the end of the book, so I didn’t need to scream. The action and adventure were even better in this book than the last one. Thomas' escape from Magnus and his leap of faith (you have to read the book to understand what that means) was so amazing! Sigmund Brouwer is a master of action for young adults. I still feel that this book was a little long in places. Towards the end, it felt a bit repetitive. Like for example, yet again Thomas does something daring, something goes wrong, someone comes to the rescue. There is a limit to how many times this can be used before it becomes tedious. I highly recommend this book and series for boys, and girls, who love adventure stories, the Middle Ages, and nonstop adventure. Was this helpful? Please vote it up on Amazon!